Will Trump back Bill Gates' dream of a renaissance? 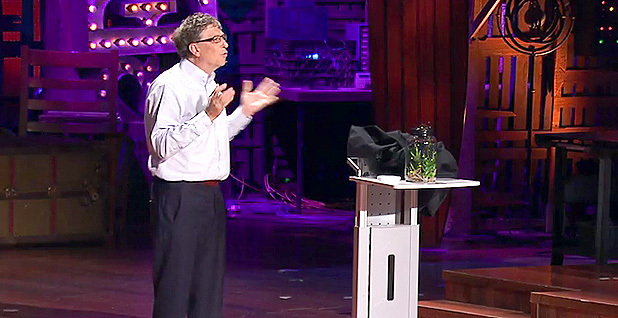 Microsoft co-founder Bill Gates opens a jar of fireflies, which he called living "energy miracles," at a 2010 TED Talk. Photo courtesy of Ted.com. Part two of a series. Click here for part one. When Bill Gates mounted a stage in Long Beach, Calif., in February 2010, the jar of fireflies he carried contained a message about nuclear energy. The Microsoft co-founder called the fireflies a living "energy miracle," the kind he said is needed to reduce the increasing poverty, failing crops and social unrest that rising man-made carbon dioxide emissions will inflict on the planet. "This is something that has to get down to zero," Gates vowed. He narrowed the options that might accomplish this heroic feat down to a new kind of nuclear reactor. "Innovation really stopped in this industry quite some time ago," Gates noted, "so the idea that there's some good ideas laying around is not all that surprising." This assertion by one of the richest, most innovative business leaders in the world could set the stage for one of the more difficult fights of the Trump administration because it poses a Hamlet-like question: Will the United States continue to be a leader in newer, cleaner, safer nuclear reactors in the future — or will someone else? The issue is tinged with untidy outcomes, such as the prospects for fewer American high-technology export jobs and the potential lack of U.S. leadership in matters ranging from climate change to nuclear proliferation. It has already created splits among U.S. environmental groups over nuclear energy. Energy and industrial groups could also find themselves in new internal debates. The lecture marked the birth of Gates' new company, TerraPower, located in Bellevue, Wash., and a nuclear research program that led last summer to the award of a $40 million, multiyear Department of Energy research grant to help the company develop a molten chloride fast reactor (MCFR). This is a machine that, according to TerraPower, will run hotter, yet more safely and economically, than conventional water-cooled reactors. It could generate electricity, but when prices for electricity are low, it could sell the heat to help industries develop a family of cleaner, higher-value products. "For example," explained Chris Levesque, the current president of TerraPower, "coal could be converted in a very clean way" to synthetic fuels that don't emit CO2. This may sound too good to be true to some people, but MCFR's attributes have attracted the attention of some influential research partners and a variety of competitors in the United States and especially abroad. Will China be the 'first mover' on commercial reactors? As Levesque described the benefits in a recent interview, MCFR is being designed to be simple enough to meet the world's growing demands for clean energy, including one-sixth of the world's population in developing countries that have little or no access to electricity. Its nuclear fuel, a slurry of depleted uranium and molten salt, will derive energy by using fuel from the nation's mounting stockpiles of nuclear waste, reducing them by breaking them up into less harmful elements. 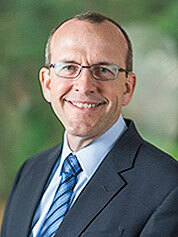 Chris Levesque, president of TerraPower. Photo courtesy of TerraPower. Beyond that, MCFR is being designed to take nuclear reactors "to the next level of safety," Levesque asserted. They will have "inherent stability" built into their nuclear cores that are being "designed to require no operator reactions to deal with unsafe conditions." When the design is completed and tested, he said, they "are going to alleviate a lot of concerns by regulators and the public" about nuclear power plants. It may be years before the design for the reactor is ready to be certified by the Nuclear Regulatory Commission, but Levesque said preliminary discussions will begin with the regulators this year, and TerraPower's partners include some of the nation's pioneers of reactor designs and commercial use. They begin with the Department of Energy and Southern Co., where Tom Fanning, president and CEO of the giant Atlanta-based utility, predicted after DOE's award that "this collaborative research effort will help accelerate the development of next-generation nuclear reactors." The upcoming discussions will be different from the 1950s, when the United States developed the first commercial reactors by itself, said Andrew Sowder, a principal technical leader at another TerraPower research partner, the Electric Power Research Institute. EPRI, based in Palo Alto, Calif., has been working with utilities both in the United States and abroad on concepts for new reactors. "We have a new administration ... concerned about U.S. jobs, plus a huge international competition for the advanced reactor," said Sowder, who said that China, which is pursuing a gas-cooled advanced nuclear reactor, will likely be "the first mover" on a commercial basis. The question, as Sowder sees it, is: "What role does the U.S. want to play? If we don't want to step up now, someone else is going to eat our lunch in this area." One of EPRI's goals is to help drive down the cost of building and operating new reactors and have them employ fewer people. "The competitor is natural gas. There are currently a lot of costs associated with nuclear that other technologies don't have," Sowder said, noting that safety issues are among them. To be competitive, he asserted, the United States must be able to demonstrate both safety improvements and cost reductions. "Otherwise, it's not worth pursuing," he said. Sowder said he thinks the most important thing the Trump administration could help contribute would be funding for a prototype plant that could demonstrate the safety and cost-effectiveness of advanced nuclear reactors. "It would be incredibly valuable, to show that it could be done, not just on paper," he said. Charles Forsberg, a nuclear power scientist at the Massachusetts Institute of Technology, said that while President Trump has focused most of his energy rhetoric on reviving the nation's coal industry, a revival is not likely to happen. That's because new natural gas-fired plants are more efficient and can work in tandem better with fast-growing solar and wind energy sources. 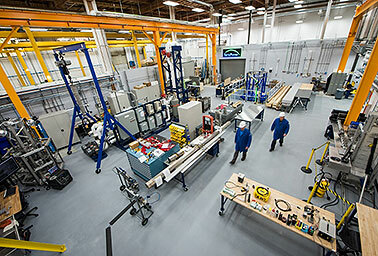 TerraPower's 10,000-square-foot lab in Bellevue, Wash. Photo courtesy of TerraPower. The big opening for advanced nuclear plants will appear first in Asia and Europe, according to Forsberg, because natural gas prices are much higher there. He pointed out that the resulting economics have sent Germany and Denmark — both countries pushing hard to reduce carbon emissions — back to burning more coal. "Trump may slow the domestic coal market's decline," but it will be very hard to reverse it, he said. Forsberg, who is designing his own version of an advanced reactor, said he thinks that opportunities for nuclear power in the international markets and concerns by U.S. utilities that natural gas prices will eventually rise will create more robust markets around the world for new nuclear plants. Proponents of new reactors, particularly those like TerraPower's, have claimed that they could cut overall costs by as much as 80 percent and supply much cheaper energy. That's because normal reactors use only about 5 percent of the energy in their fuel, while advanced reactors can reach 95 percent, leaving substantially less radioactive waste behind in the process. The current world fleet of nuclear reactors produces 386 gigawatts of electricity, but proponents predict that the demands of the future market could be as high as 1,600 GW by midcentury, creating major new markets for skilled jobs. The idea that a reactor cooled by something other than water might become the prototype for an advanced reactor, Forsberg said, originated in the United States in the 1950s during the Cold War, when the Air Force tried to develop a lightweight, airborne reactor to increase the range of its long-range bomber fleet. Water slows down the speed of neutrons given off by uranium fuel that starts the essential nuclear chain reaction, but alternative coolants, such as molten salt, can speed them up. That led to what is called a "fast reactor" that produced more hot air, which the Air Force wanted to feed into the combustion chambers of its jet engines. The application was scrapped in the 1960s when the evolution of more accurate guided missiles proved to be a more effective way to deter a nuclear strike from the Soviet Union. In the 1970s, the "fast reactor" concept morphed into what is called a "breeder reactor" as researchers learned that its enhanced power came from boosting uranium isotopes to a heavier element called plutonium that, like the small amount of uranium-235 in conventional nuclear power plant fuel, can start a chain reaction. Here was a new energy source that allowed a reactor to "breed" more plutonium fuel that it could use, a fuel that could then be shipped to other reactors. "The highest priority program was to use fast breeder reactors to light American cities," recalled Thomas Cochran, a nuclear physicist and former senior scientist at the Natural Resources Defense Council, one of a number of environmental groups that pushed Congress to reject funding for the breeder reactor in the 1990s because of its expense and dangers. Plutonium is also the most widely used material in making nuclear and hydrogen bombs and warheads, and shipping this nuclear fuel around the world posed serious nuclear proliferation risks. Levesque, the president of TerraPower, maintains that his company's reactor design has eliminated proliferation risks by keeping the plutonium sealed in the reactor, where the heat and lethal radiation will keep it safe and producing energy for the lifetime of the power plant. Ed Lyman, senior scientist at the Union of Concerned Scientists. Photo courtesy of the Union of Concerned Scientists. Other companies developing advanced, fast reactors make similar claims about reducing proliferation, although their design approaches differ widely. Companies in Russia, China, France, Japan, Canada, India and South Korea are also planning to compete for what they expect will be a large new global nuclear energy market, but whether their designs will be safe or not remains an unanswered question. "The rules and risks for this class of reactors are not established yet," said Kenneth Luongo, a former non-proliferation expert for DOE during the Clinton administration. He said he expects Russia and China to heavily subsidize their reactors in the international market. "Some of these reactors look like breeder reactors, and we've said there should be no producing of plutonium for use by other reactors," said Luongo, who is leading an effort to assemble a panel of experts to see whether there can be some kind of international consensus. "This is definitely a new technology race that no one has focused the lights on," he said. Ed Lyman, a physicist and senior scientist at the Union of Concerned Scientists, remains unimpressed. "There's a plutonium glut around the world, particularly in the United States, so no one needs to breed plutonium," he said. "Reactor vendors have changed their marketing strategy to say they can actually burn up wastes. Of course, that's not really true, either. I'm working on a report that will spell all of this out in detail, but it's very misleading." 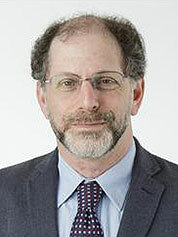 Armond Cohen, executive director of the Boston-based Clean Air Task Force, said he thinks the recent Paris climate change agreement involving 195 nations provides the economic, political and strategic reasons for the Trump administration and a bipartisan group in Congress to keep the United States — with its long history of nuclear safety regulations — involved in this discussion. "We need the policies that will support demonstration, scale-up and export of the advanced nuclear technologies that prove out," he said. Climate change is spurring growing interest from previously anti-nuclear environmental groups in advanced reactors and in keeping older nuclear reactors running, as well, Cohen asserted. The Paris pact requires carbon-free energy to stop CO2 growth by midcentury. "Zero means zero," he said, "and we don't have many decades to do that."